Whether you are off to grandma's house for the holidays or you're embarking on a weekend getaway to the beach, it's always a good idea to arm yourself with games for a road trip. Since the debut of the automobile and the subsequent family road trips that followed, people have looked to games as a source of entertainment while driving mile after mile after mile. Parents with young children especially embrace game playing as a way to stave off the migraine-inducing chorus from the back seat: "Are we there yet?" The classic boredom buster is perfect to play on the road. Plus, it is simple enough that the entire family can participate. To play, have one person look around and select an item to describe. That person then gives verbal clues using the words "I spy." For example, a person might say, "I spy with my little eye something that is blue and rhymes with daughter." If someone in the vehicle guesses correctly, then he picks the next item to describe. Landmarks, objects in the car and fellow passengers are good options. You can't go on a long road trip without playing 20 Questions. The time-honored game requires one player at a time to think of a famous person, place of thing. Then, the other players get to ask 20 "yes" or "no" questions in order to figure out the mystery item, place or person. Sample questions include: "Does it appear in movies?" or "Can you eat it?" The player who guesses correctly gets the chance to stump the rest of the clan. This tried-and-true travel game goes by a number of similar names, such as "geography lesson" and "geography game." Whatever name you choose, the object of the game is the same. Think of a geographic location, be it a city, state, country or continent, and say it out loud. For example, "Hawaii." The next player then has to think of a place that begins with the last letter of "Hawaii," such as "Indiana." Then, the next player needs to state a place that starts with the letter "A." Players may not use the same location twice and all of the places must be legitimate. 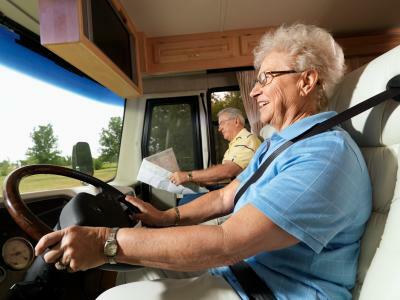 In an age where the family vehicle has morphed from a contraption on four wheels to a mobile living room, it is not unusual to find a host of electronic games for a road trip available to travelers. Passengers of all ages can't seem to unplug themselves from high-tech gadgets, which is why a litany of manufacturers has created portable electronic games for people to play on the road. The aforementioned classic games and others, such as License Plate Bingo and Scavenger Hunt are a dying breed in the 21st century. These days, kids and adults alike don't leave home without their portable digital devices, which feature dozens of different video games. Gadgets such as the iPhone and iPad allow users to add game programs, which can be accessed around the country. Finally, if your kids are obsessed with video games then it is highly unlikely that they will leave home without their PlayStation Portable or Gameboy. The extremely popular handheld electronic entertainment systems can keep kids busy for hours while on the road, and are often referred to as "virtual babysitters." There is no need for the idea of a road trip to send you into a panic. Whether you take a gamble on video games or you stick with classic road games, killing time while you hit the highway can be a piece of cake.